All you’ll need for a visit to Dublin. 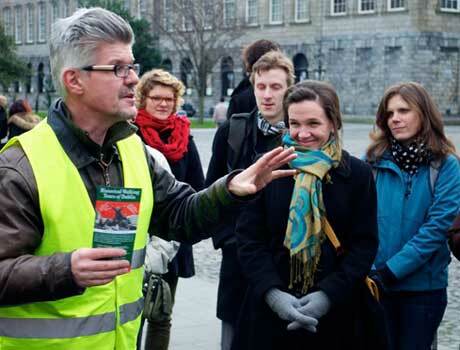 In just over 2 hours, this Fáilte Ireland-approved, award-winning and entertaining walking tour, conducted by our guides, history graduates of Trinity College Dublin and the National University of Ireland, explores the main features of Irish history - Dublin's development, the influence of the American and French Revolutions, the Potato Famine, the Great War and the 1916 Rising, the War of Independence, the Northern conflict and Ireland today. Meet: Trinity College (front gate). Tickets: €14, €12 students, under 14s free. Available all year round at any time for groups up to a recommended maximum of 25, €250 (inc. VAT @13.5%) for a 2 hour+ tour. Suitable for University, School, Conference and Corporate Groups. Previous and ongoing clients. Available all year round at any time for 4 people or less, €190 (incl. VAT @ 13.5%).